The Sudanese Aspects of Politics Highlight All that Happens in Sudan! 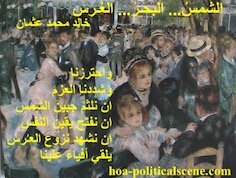 Sudanese Aspects of Politics to Understand! The Sudanese aspects of politics, or by another definition the Sudanese political aspects differ from any other political aspects in the world. This is why understanding the term "democracy" is different too. The differences are in the Sudanese way of practicing politics and democracy and applying them in a diversified multi-ethnical society with different beliefs, cultures and traditions. 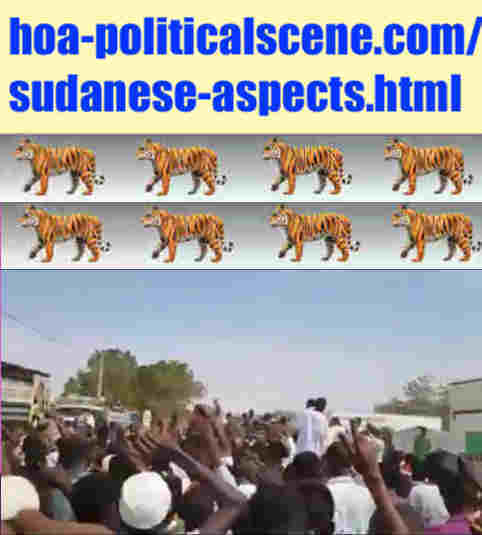 Discover all of that on this page about the Sudanese political aspects. hoa-politicalscene.com/sudanese-aspects.html: Sudanese Aspects: جوانب سياسية سودانية Khalid Mohammed Osman's political quotes in English. مقولة سياسية لخالد محمد عثمان بالانجليزية. Intro to Sequence 1, Episode 4, Sudanese Aspects! To discover that, you need to read the 3 episodes before this one and then read the Sudanese aspects of politics and continue to other episodes. The episodes are in a sequence of Sudanese articles, I organized alphabetically and numerically to make browsing and reading the HOA Political Scene Network perfect. You'll understand how the Sudanese society is different, what are the problems in this society and how the Sudanese natives understand politics and how they practice it. The society is different not only because it is composed of different beliefs, cultures and traditions. But, it is in fact different because of that the politics and democracy in Sudan are terms supposedly used by the Sudanese ruling elites through history with one common sense and understanding to get power and wealth for the benefits of those elites. You'll learn more than that. For example, why Sudan has never known stability since the independence from Britain in 1956? Why there were always shift from what's called decocracy to military dictatorships? Why the Sudanese political parties, including religious parties, as the Muslim Brorthers of Sudan and the Sudanese sectarian parties assist, or bring Sudanese dictatorial regimes every decade? Why those parties have in common conspiracy theory of sects added to what I have descriped long ago as Muslim Brothers conspiracy theory? How it hapeens that there is no Sovereignty in Sudan through decades from the independence day until now? 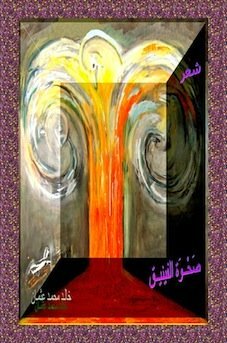 This is episode 4 under the title Sudanese Aspects. Episode 1 in the sequence is at Sudanese Analyses. Episode 2 is at Sudanese Angles. Episode 3 is at Sudanese Apprehension. 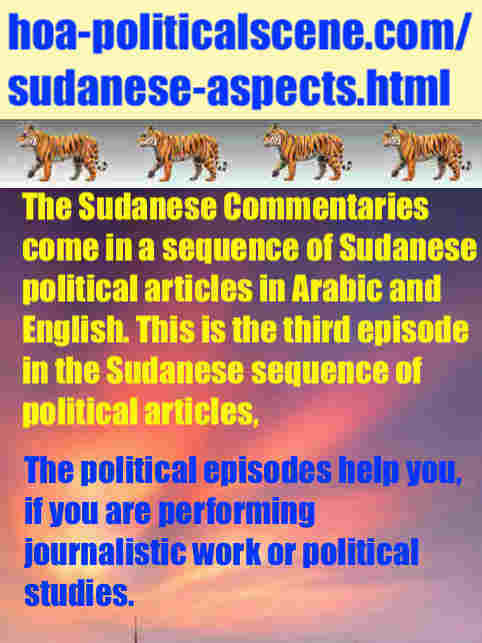 The Sudanese political episodes, whether they are in the Sudanese Arabic political articles, or in the English version of the Sudanese political articles help you, if you are performing a journalistic work or political studies to perform your specialties better. Episode 4 here continues on episode 5 at "Sudanese Assessment", episode 6 at "Sudanese Awareness", episode 7 at "Sudanese Backgrounds", episode 8 at "Sudanese Balance", episode 9 at "Sudanese Bases", episode 10 at "Sudanese Basics", episode 11 at "Sudanese Beliefs", episode 12 at "Sudanese Briefing" and some other episodes. Like the alphabetical and numerical order of the sequence and the episodes? Tell us by using the form on this page. You ended on Sudanese political apprehension by reading the last line in the episode where I mentioned something about "the Sudanese octopus policy". Here is the rest of that term, with additional episode. Index 4, Episode 4, Sudanese Aspects of Politics! Such kind of policy is always practiced by the Muslim Brothers of Sudan. They practice this policy by changing plans, strategies and tactics every decade and by changing the name of the party to fit the demands of each decade. They began with it when they were called by this name in the forties for more than a decade and then continued with it when they changed the name in the second decade to the "Islamic Charter Frontً، or the "Islamic Convention Front" and then changed it in the third decade to the "National Islamic Front" (NIF). When they are quite sure of the success of their tactics and policies they planned the military coup in 1989 to be in power for ever. At that time many of them have been heard saying that "after this we will never surrender and we will remain in power until we submit this power to the Messiah". They said this even though they pretend to be Muslims and they know from their Islam that the "Messiah" will return and receive the charter after very bad conditions, where all the people sin and he will come as a saviour to liberate and save those people from sin, bring justice and peace upon earth. I told some of them that means they are the rulers of sin, as long as they say that they will submit to Jesus. That explains everything about how rude and sinful they are. I explained this to a group of them and they threatened me, before I fled from home. I have seen their leader and his wife many times visiting them with a Samson bag full of dollars. I knew that time Mr. Dollar is their guide, but not the Islam. 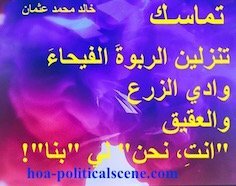 hoa-politicalscene.com/sudanese-aspects.html: Sudanese Aspects: جوانب سياسية سودانية Khalid Mohammed Osman's political quotes in Arabic language. مقولة سياسية لخالد محمد عثمان. It is very bad to lie to ourselves. When people lie to any authority, they lie to themselves. When they lie to get personal advantages of any public favors, they lie to themselves. They know that they lie to themselves and anything that they have acquired by lying is fake. They keep lying, as if they don't know that the truth will come out, one day. Lying, in the case of individuals, is personal and we don't care about any personal thing, until it affects the public. The authorities in Sudan lie too. They lie, whether they are civilians, or militants. The power and wealth they get from their lies keep them lying. When the public discover the lies, they break up in demonstrations to storm the streets. Lies of authorities are not just about personal issues. They are about deceiving the public, by not telling the truth about any problem, whether it is cultural, economical, political, or social. What I define in the article is that people don't know that lying has three colors. One, or two of these colors might not be harmful. But, the third one is damn so harmful. That is lying to the public. hoa-politicalscene.com/sudanese-aspects.html: Sudanese Aspects: جوانب سياسية سودانية Revolutionary Ideas. نمو الأفكار الثورية، الثورة السودانية. Sudanese uprising, January 2019. 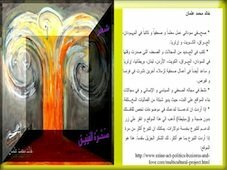 Did you find the Sudanese Aspects of Politics useful? 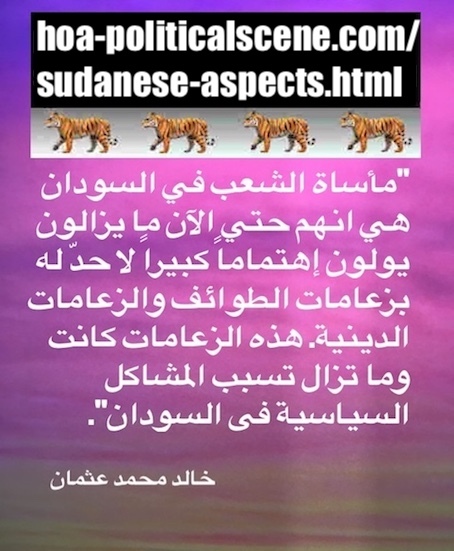 Why not comment on the Sudanese Aspects and share the address of the page? Use the Comment C2 Entries form to comment on the Sudanese Aspects of politics, or to write about Sudan. Your comments will add values to "Comments on Sudan". 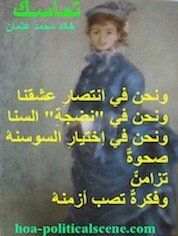 In addition to textual Sudanese Aspects, you can find documentaries on films at documentary film on TVCinemaApp.com. 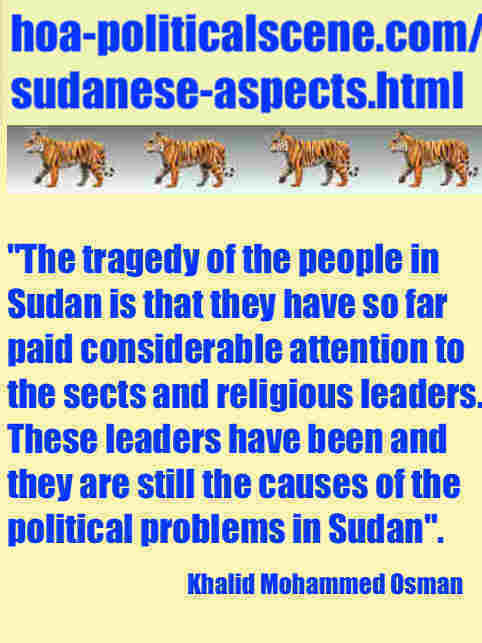 Comments on the Sudanese Aspects of Politics, and other comments readers write about Sudan and its political development appear on the section of the page below the comments form and above this paragraph.